Diluvium has attained a level of musicianship that is very elegant and attention grabbing, preventing the listener from losing interest. 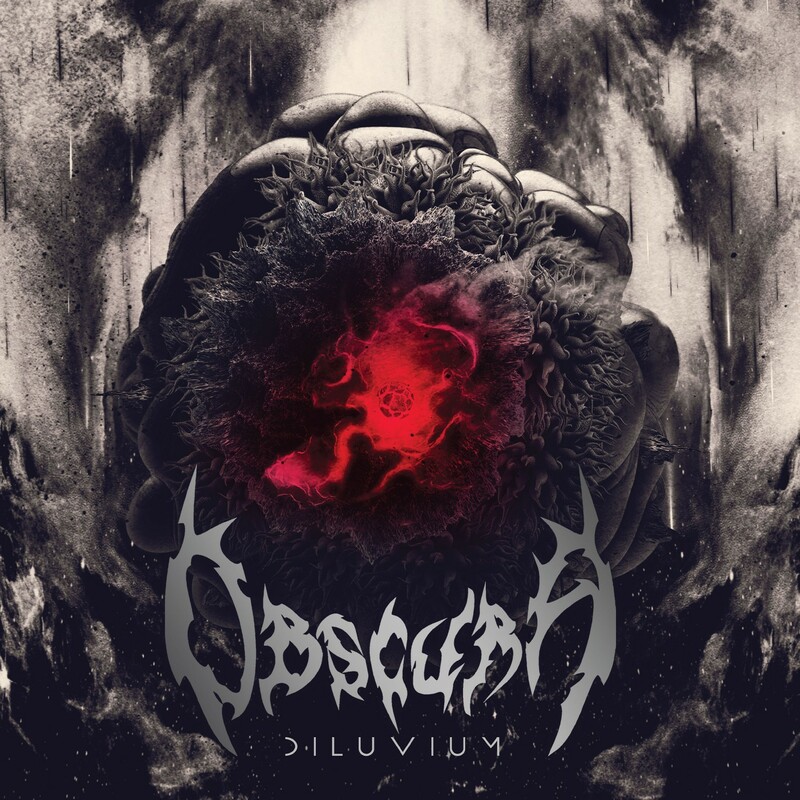 Considering the modern production combined with the songwriting styles reminiscent to Cosmogenesis and Omnivium, this is probably my favorite Obscura album to date. The German technical death metal titans Obscura return with their fourth concept album, Diluvium, to end the cycle of their conceptual musical journey. With a relatively new lineup, it was very exciting to see how Obscura would come back from the critically acclaimed album Akroasis. They have 55 minutes to offer on this record with twelve tracks. Let’s take a look into how this album takes shape! At the very beginning of the album we have “Clandestine Stars.” Obscura wastes no time and gets right down to business with punching rhythms which foreshadow the remarkably tight musicianship that this album will showcase. The guitar riffs are wildly electric and melodic, laced with five over four polyrhythms, accompanied by the virtuosically precise drumming of Sebastian Lanser. Linus Klausenitzer’s fretless basslines play a very musical and unique role in the music, referencing and supporting the guitar work of Stephen Kummerer and Rafael Trujillo. Klausenitzer’s melodic capabilities are especially emphasized in his bass solo, and also in comping the guitar solos following it. The song weaves all of these elements together and creates a woven web of technicality, melody, groove, and abrasiveness. Diluvium‘s self-titled track was released to tease the album. The song bursts with energetic arpeggios, creative manipulations of time subdivisions, and frenetic alternations of triplets and straight rhythms. Lanser adds an aggressive quality to these arpeggios by replicating the rhythms with the kick drum as he adds to the groove with cymbal and snare accents. This track represents the bulk of the album well, showing off the record’s impeccably tight, pristine production. This really shows how very clean production can make the syncopated rhythms that Obscura use pop out and shine in the music. It also makes it an aesthetically pleasing sound to listen to as the kicks bursts out blisteringly fast sixteenth note runs with such precision accompanied by the classic melodic riffs that Obscura has to offer. It is clear that the band is stylistically calling back to the earlier days of the their music. They achieve that intent quite well, as a majority of the songs reminded me of the Cosmogenesis era. Although the structure of the song seems a little loose, it is still a very strong single to warm up the fans. Tracks such as “The Seventh Aeon,” however, show how proficient Obscura can be in simpler compositions, while still maintaining their core sound. The riffs swing in 6/8 with the use of a more melancholic chord progression, adding a bit of emotion to the ever so mechanical and technical sound Obscura possesses. Klausenitzer has many places to shine in this track, with brief yet very flavorful and emotional bass playing employing a beautiful timbre that only the fretless bass could make. Although this track may be the least technical outing on the album, it may be the most conceptually challenging piece to play, as the phrasing of the instruments would not be easy to replicate. The phrase usage of Klausenitzer has always been special to me, as his melodic commentaries never fail to cause me to admire the groove and melodic complexity that contributes to the song. Obscura never fails to deliver a release full of melodic and rhythmic complexity. On top of that, the remarkably clean production made all of the elements of Obscura that I admire stand out tenfold. Although some of the songwriting may veer dangerously close to the works on Akroasis (“Convergence” compared to “Akroasis”), diversity is also delivered well on this record with songs such as “The Conjuration” showing off their heavier and grittier style and sound. Diluvium has attained a level of musicianship that is very elegant and attention grabbing, preventing the listener from losing interest. Considering the modern production combined with the songwriting styles reminiscent to Cosmogenesis and Omnivium, this is probably my favorite Obscura album to date. It is a very strong return from the tech death titans of Obscura. Next PostJohn Coltrane - "Both Directions At Once: The Lost Album"